With the boom of social media, it may be difficult to distinguish which platforms will help your small business. Since it has been launched, Pintertest has been especially popular due to its visually attractive content. Within this article you can find information on why 'pinning' may give your small business some influence. Pinterest is a pictorial goldmine for all those who are creative, wish to be creative, or simply want a visually stunning escape. When it launched, Pinterest was everywhere and everyone was excited for it. The good news is, that fervor continues to grow. Many people are hip to join the Pinterest bandwagon, but aren’t quite sure why it might be important for them to do so as a small business. Here is some information that might help you decide why it is right for you and how best to leverage its influence. Create boards with themes that speak to you or your business. Follow others that share your same taste in pins. Your feed willl be filled with their pins. Repinning pins from within your feed or your search on Pinterest. Pin original content from the web. The easiest way to do this is to download Pinterest 'Pin It' widget that you can find on Pinterest, is free and lives in your bookmark tool bar. 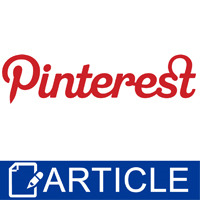 Individuals use Pinterest as a great resource for projects, style tips, recipes- you name it, it's on there! Companies use Pinterest as a strong marketing tool to get their names and products out there to a number of new markets by pinning their products/ adviceto their boards. Along with these monster usage and activity stats, some more important statistics for our industry are just WHAT people are pinning and who’s doing the pinning. The DIY & Crafts category is the second most popular category to be pinned on PInterest with 9.6% of all pins on Pinterest being dedicated to that category (Source: Repinly) and the click-through rate for tutorial, DIY & recipe pins is 42% higher than other pins. (Source: Search Engine Journal) The audience for Pinterest is also very attractive to our industry as it mimics our demographics: 80% of Pinterest users are women with the two most popular age groups being 25-34 year olds and 35-44 year olds. (Source: Anson Alex) Click on any of the sources to find even more statistics! This social media outlet provides very valuable exposure and, if trends can predict, should only continue to grow. Like all of the social media outlets out there, Pinterest is free and can provide the word-of-mouth marketing to a vast audience. Take advantage of this growing medium and get your products out there to promote not just your business but also the industry as a whole.